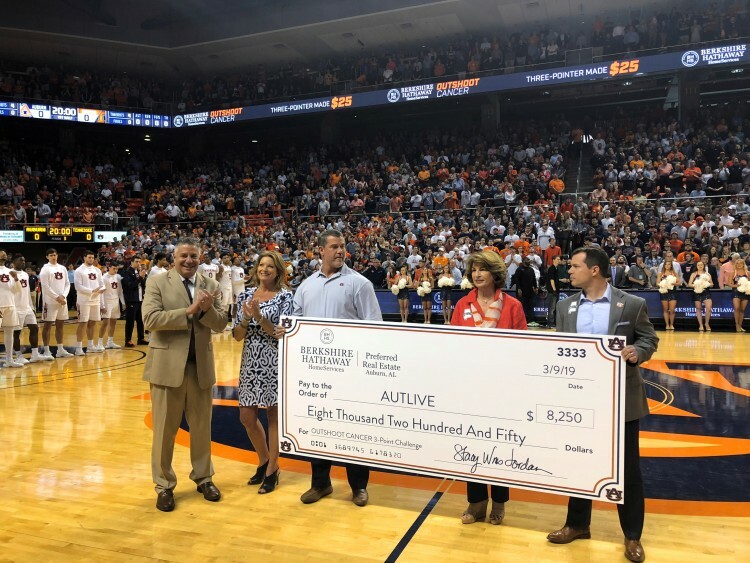 Recently at the Auburn Men's Basketball regular season match-up against Tennessee, Berkshire Hathaway HomeServices' Owner and CEO, Stacy Williams Jordan, presented a check for $8,250 to Coach Pearl's AUTLIVE Cancer initiative. Stacy was joined by Dave Turnbull and Sallie Deen from BHHS along with Vice President and General Manager of Auburn Sports Properties, Chris Davis. The donation was a result of the season-long sponsorship of the OUTSHOOT CANCER 3-point Challenge. Berkshire Hathaway is donating $25 to Coach Pearl’s AUTLIVE CANCER initiative for every three pointer the Tigers make during the season. Prior to the start of the Tennessee game the team had hit 330 three pointers for a total of $8,250. Auburn hit 13 3-pointers during the game bringing the season total to $8,575. Berkshire Hathaway was proud to present Coach Pearl with this significant donation and look forward adding to the total during the SEC Tournament! As the Official Real Estate Partner of The Auburn Tigers, Berkshire Hathaway HomeServices Preferred Real Estate is proud to support Auburn Basketball, Football, Baseball and all sports across campus.